KYIV, Ukraine—The hands of the 19-year-old Ukrainian soldier seemed too old for the rest of him. They were tanned and dirty, calloused in places, scarred in others. A white crucifix dangled from one wrist. Two years after a mortar on an eastern Ukrainian battlefield killed that young soldier with the old hands—whose name was Daniel Kasyanenko—I visited his parents in the town of Zaporizhia. Daniel’s mother, Marina, told me about the last time she saw her son alive. “He went to war as a boy and came back as a wise old man,” she said. Daniel had suffered a head injury from a mortar blast during a battle in June of 2015; he had come home to visit his parents to recuperate for a few weeks the following July. While he was home, Marina had begged her son not to return to war. But Daniel was determined to go back anyway. As Marina watched Daniel sleeping in his room on the day prior to his return to war, she noticed his hands, as I had, and how worn and old they looked. One month later, she folded those hands as in a prayer and slipped flowers beneath them as her only child lay in his coffin. 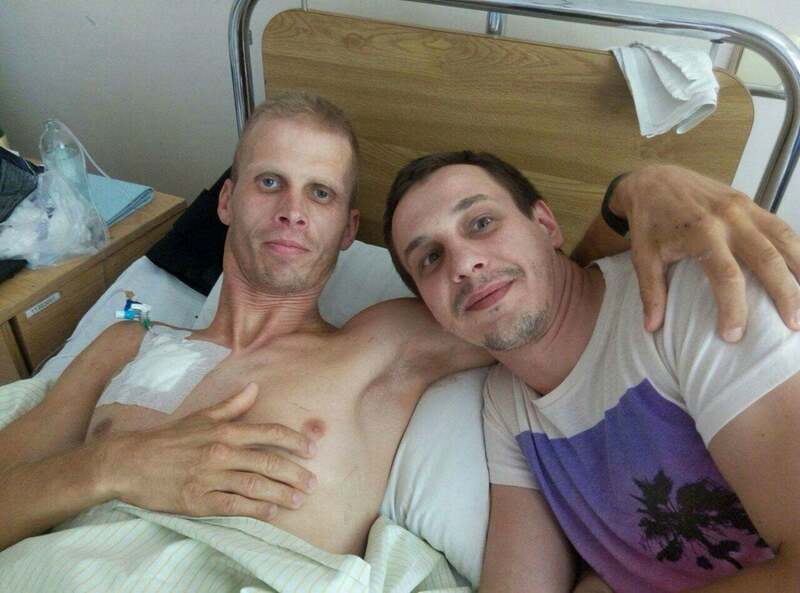 My friend Konstantin Bernatovich, another Ukrainian soldier, had hands that were tanned, dirty, scarred, and calloused, too, just as Daniel’s had been. 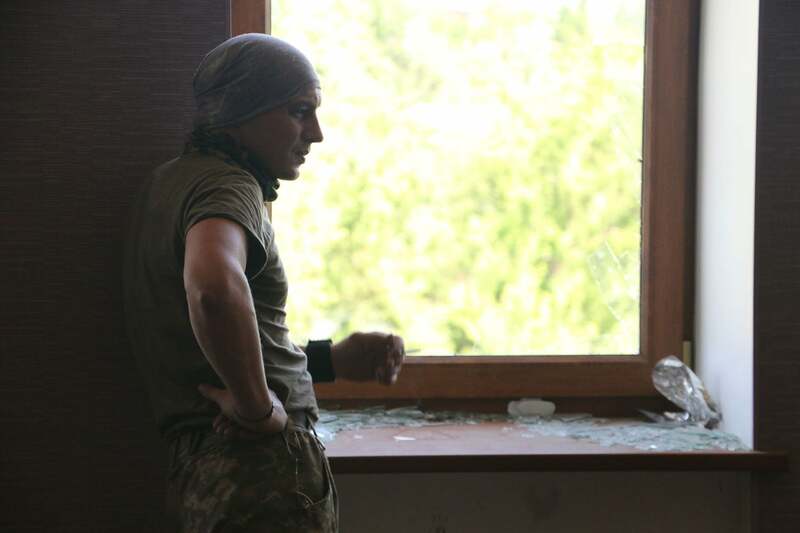 Ukrainian soldier Konstantin Bernatovich on the front lines in the Ukrainian town of Pisky. 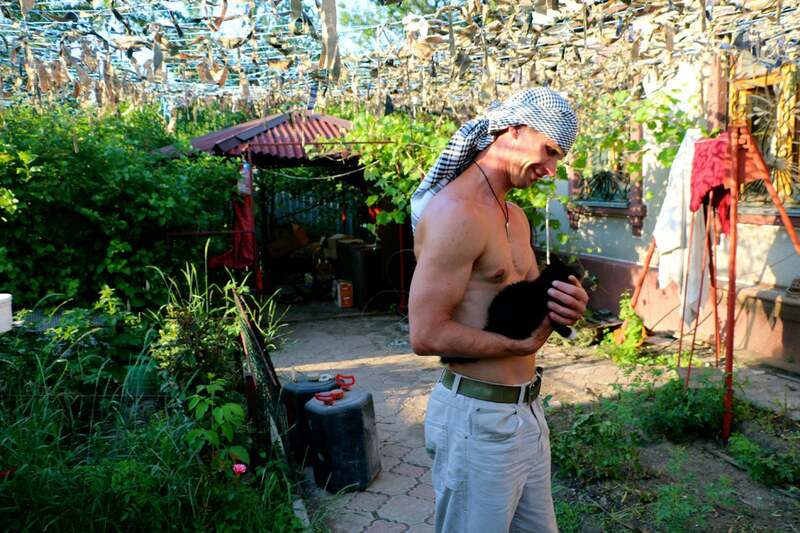 In June 2015, I had parted ways with Konstantin in eastern Ukraine’s war zone. A couple months later, we met in Kyiv. Konstantin was home on leave for a few days to visit his twin sons for their 13th birthday. We sat at a café on the Obolon Boardwalk, where we watched water-skiers and jet-skiers out on the Dnieper River enjoying the warm summer weather. Konstantin’s hands, still weathered from combat, trembled as he tried to light a cigarette to calm his nerves and abate the adrenaline rush spurred by seeing me, a living reminder of the war. The soldier told me he needed a minute alone. “Too much adrenaline,” Konstantin explained apologetically. As her husband walked away, Konstantin’s wife, Zhanna, shook her head sadly. “He hasn’t been the same since he went to the war,” she said. A Ukrainian soldier known by the nom de guerre Nemo while on the front lines in eastern Ukraine. I also remember the hands of another Ukrainian soldier I knew from Ukraine’s front lines. He went by the nom de guerre Nemo. Tough and battle-hardened in the war, I now remember Nemo as I last saw him in August 2016—in the bed in the military hospital in Kyiv, his hands freckled with scabs from sandblasted grenade shrapnel. The soldier’s once tan and muscular body was, on that day, pale and gaunt with a tube stuck in it collecting his metabolic waste into a bag, which a grumpy nurse came to empty into an old metal pan from time to time. A bullet had torn through Nemo’s intestines and colon; a grenade had left his body pockmarked with shrapnel wounds. Yet, when Nemo shook my hand, his grip was still hard as iron, as it had been when I first met him in June 2015, when he was a fearless recon soldier who went out, night after night, on dangerous missions across no man’s land. “Friend,” Nemo, who grew up in Crimea, said to me in Russian as I parted ways with him that day in the hospital. He held up a clenched fist. I returned the gesture. Sometimes, it’s the normalcy of hands, which seems so remarkable considering what they’ve done. I remember the clean, steady hands of the U.S. Air Force A-10 “Warthog” attack pilot as he ate frozen yogurt in the chow hall of the U.S. military base in Kuwait. He wore a wedding band on his left ring finger. The pilot was a friend—I won’t mention his name for the sake of his and his family’s safety. We had gone through Air Force pilot training together at Columbus Air Force Base, Mississippi, way back in 2008 when we were both lieutenants and when war was nothing more to us than an abstraction, even if we were training to wage it. 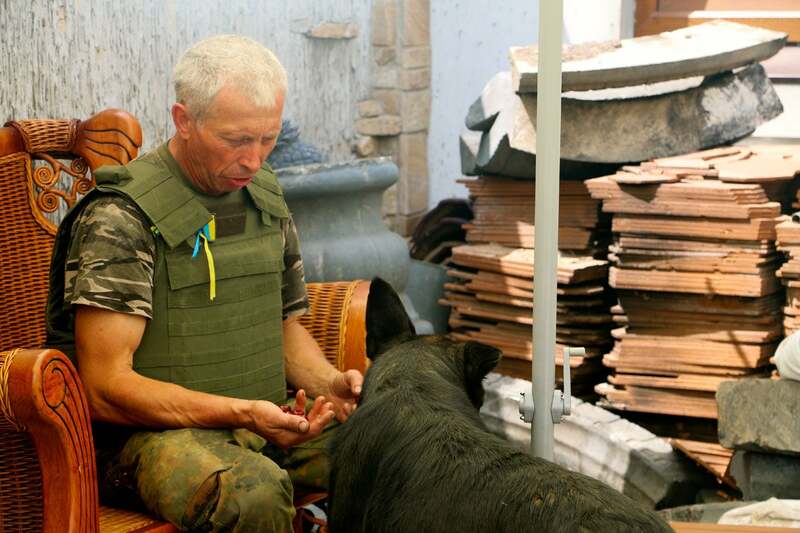 Ukrainian soldier Vasiliy Ivaskiv, then 53 years old, enjoys a quiet moment in the eastern Ukrainian war zone in June 2015. On that day in Kuwait in September 2015, my old friend’s hands did not flinch nor tremble, nor did his stolid expression waver as he explained the carnage he inflicted on Islamic State militants every day from the air. Sometimes, the pilot said, he killed dozens of enemy militants in a single mission. 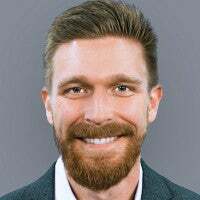 He laughed without humor as he described the disorganized, terrified way in which the terrorists fled at the sound of his jet. Sometimes the pilot killed with a bomb, sometimes with the A-10’s 30 mm Gatling gun. Either way, he delivered death through a few foot-pounds of pressure on his trigger finger. Moreover, the Warthog flies low. Thus, unlike in some other Air Force warplanes, A-10 pilots often see, through their own naked eyes and not a computer screen, the enemies they kill. As my old friend described the killing he did, I studied his hands—I was in awe of the power they wielded. Those hands, once in the Warthog’s cockpit, were among the most lethal weapons of war America possesses. There are other times when hands are like a roadmap to a life that has seen more suffering than most of us have the creative capacity to imagine. I remember the hands of the 77-year-old former Tibetan freedom fighter who had been a Buddhist monk unwilling to kill even an insect before China invaded his homeland in the 1950s. 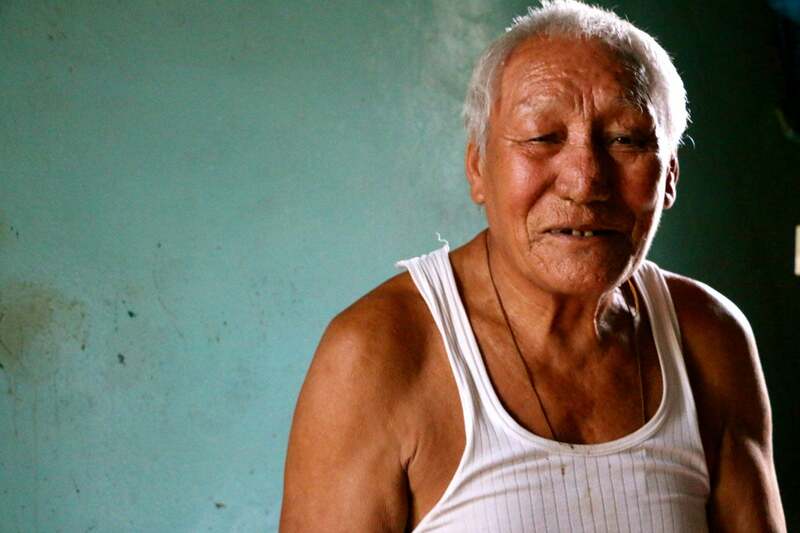 “When the Chinese came, they raped women, they bullied, they killed,” the old freedom fighter, whose name was Jampa Choejor, told me. Jampa Choejor fought with the Tibetan resistance until 1974. Choejor renounced his monastic vows to become a soldier, fighting with the Tibetan resistance army, called the Chushi-Gangdruk, from 1959 until 1974. Like many Tibetan resistance soldiers, Choejor received training from the CIA as part of a secret American Cold War military operation against Communist China in Tibet. I met Choejor in October 2015 at the Jampaling Tibetan refugee settlement in Nepal. On that day, the old Tibetan man’s dark, spotted hands thumbed a coil of Buddhist prayer beads with steady precision as he told me how he had killed Chinese soldiers, both with a knife and with a rifle. Even in old age, Choejor did not regret the killing he had done. “In the beginning, I was thinking we were monks, and so we shouldn’t kill,” Choejor explained. His only regret, the old Tibetan freedom fighter confessed, was that all the suffering he had endured and all the violence he had waged had made no difference for his people in the end. The Tibetan nation still lives either under Chinese occupation in Tibet or as stateless refugees, scattered throughout countries like India and Nepal. As I left Choejor, he folded his hands as in a prayer and bowed. I returned the gesture. So many hands. So many stories. There were the hands of the Kurdish peshmerga soldier laid flat before his bowed head as he performed salat, the Muslim prayer ritual, on the roof of a Kurdish fort outside the embattled Iraqi city of Mosul. Beyond the praying soldier, over the parapet of the roof, the sun was setting over the tan plains of northern Iraq on an evening in May 2016. Overhead, a U.S. F-16 fighter jet snarled as it cut across the darkening sky. 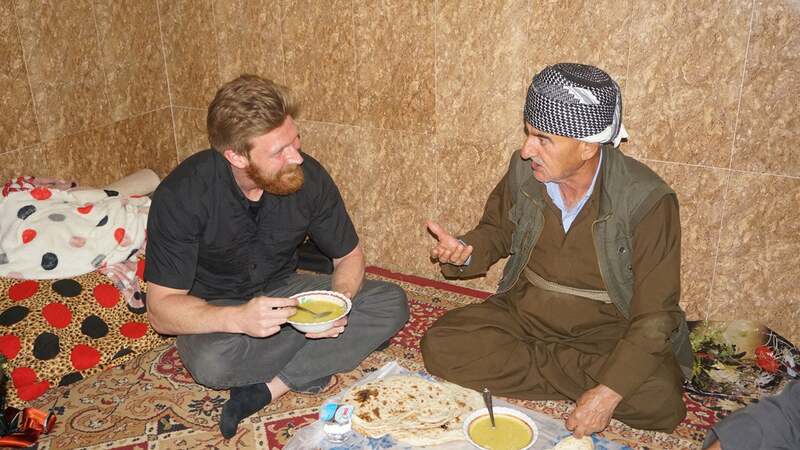 The author, left, shares a meal with Kurdish peshmerga Gen. Omar Hama Ali Farag outside Mosul, Iraq, in May 2016. Then, a moment or two later—the distant percussive thump of an airstrike. In the distance, the blue-black mushroom cloud rose like octopus ink from where the bomb had impacted, and where Islamic State terrorists had probably just died. The peshmerga general stood with his hands authoritatively clasped behind his back. Some hands convey emotions as potently as any words or facial expressions can. 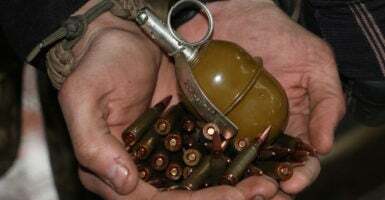 There were the trembling hands of the Ukrainian soldier in the front-line town of Pisky, trying to light a cigarette after a Russian artillery barrage had nearly brought down the house in which we had taken shelter. The hands of Vasiliy Ivaskiv, a then-53-year-old Ukrainian soldier in June 2015, beckoning me forward to cross a road in Pisky as a sniper’s bullets zipped and popped all around us. 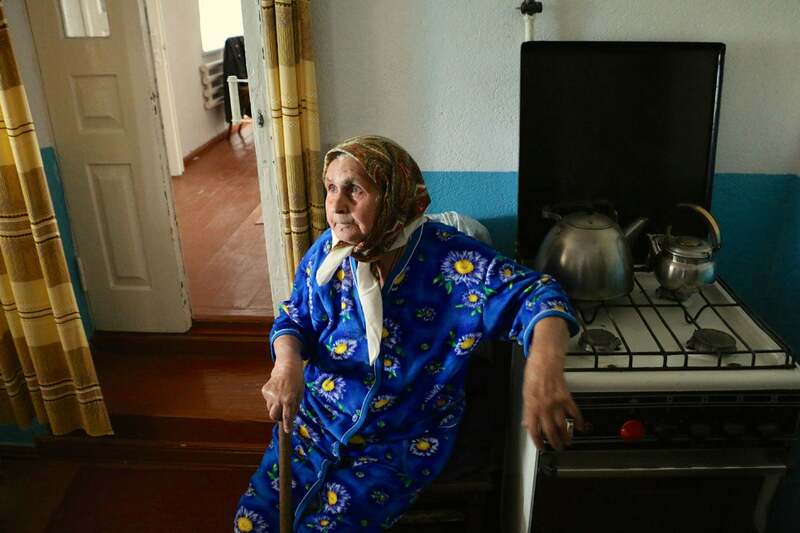 Of course, I’ll never forget the hands of Nina Konstantinovna, who was 87 years old in August 2015 when I met her in the eastern Ukrainian town of Sartana, where she lived on the front lines of Russia’s ongoing proxy war against Ukraine. I visited Nina the day after a Russian shell had destroyed her home. She had been sleeping when the shell hit in the night. Having narrowly escaped death, Nina crawled through the smoke and fire, wondering if more artillery was on its way. Nina Konstantinovna survived Stalin’s mass famine in the 1930s, the Nazi invasion in World War II, a half century of Soviet rule, and, lastly, Russia’s ongoing proxy war in eastern Ukraine. As a girl, Nina had survived Stalin’s mass famine in the 1930s known as the Holodomor, which had killed millions in Ukraine. As a teenager, she’d survived the Nazi invasion and occupation of Ukraine in World War II. Then, she had lived most of her adult life through the subsequent half century of Soviet rule. Another war had interrupted the twilight of Nina’s life. But, she had survived that one, too. Nina recounted how, during the Nazi occupation, she had rubbed chemicals on her hands and arms to make it look like she had a rash. That way, she explained to me with a wry grin, the Nazis wouldn’t send her to Germany as a slave. I remember how Nina rubbed together her hands—by then worn, wrinkled, and spotted with age—as she told me that story. A Ukrainian soldier known by the nom de guerre Nemo, left, beside Konstantin Bernatovich, also a soldier. Finally, there were the hands of the dead soldier on a quieted battlefield outside the Ukrainian city of Mariupol in September 2014. The body of the soldier—what was left of it, anyway—was black and charred and with half its skull missing. One hand was stuck out in front, palm facing away, as if the man had tried to stop whatever it was that had killed him. I remembered, then, the plaster molds of the dead from Pompeii, frozen in the moment and the motions of their deaths. Yet, that was no plastic mold of the dead. I could smell the day-old death. The flesh from the soldier’s lifeless hand had partly melted away, revealing little bits of burnt bone underneath. I’m not religious; quite agnostic to tell you the truth. But with that dead soldier before me, I made the sign of the cross with my right hand. Somehow, it felt like the right thing to do. Or, maybe, it was all I could do. We touch the world through our hands. And our hands reveal how the world has touched us.